Not only mature by name, MatureDating.com is also mature by nature. This is an extremely useable and attractive website. With some useful tools including “Date cast” which lets you mass message users and helpful tutorials every step of the way, you can see why it’s so successful. In addition, if you aren’t sure how to approach someone, you can take advantage of the ready-made ice-breakers. If you are confident, then why not use the “Date cast” tool? This kills many birds with one stone, allowing you to bulk message everyone who appears in a search return. Also, there is a real focus on real-life dating too. 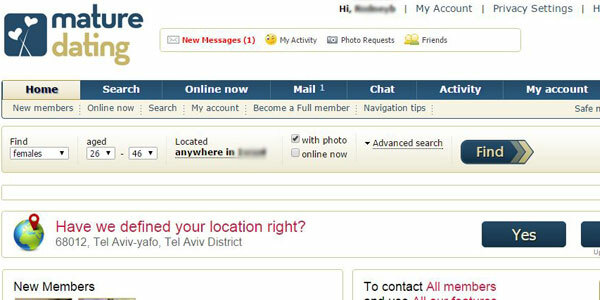 This includes a great tool to find singles events in your area and general date suggestions. All you need do is fill in your specific criteria. The sign up process is very simple and takes just a matter of a few minutes. You will be asked for some basic details, including your gender, date of birth, postcode and e-mail address. That is just about it. However, you are well advised to spend some time filling in your Mature Dating site profile with pictures, personal details including physical features and interests. In particular, there is a self-written section which will allow you to better showcase who you are and what you are looking for. Online safety is an understandable concern for many, but you should find no issues at all at MatureDating.com. For a start, the site is protected by an SSL encryption system to avoid any personal information being leaked. There is also a requirement for new users to verify their account via e-mail, which helps eliminate scammers. 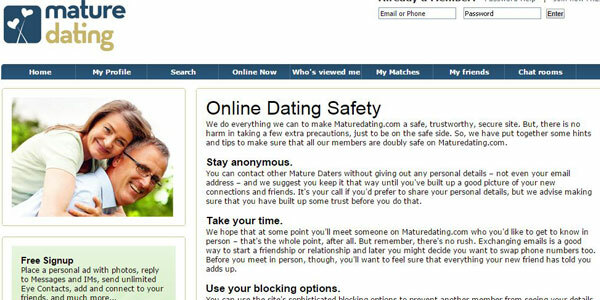 Meanwhile, there is also a page of safety tips for online and offline dating. And if you do feel in any way suspicious, other users can be reported to site administrators via the live chat help service. Free users are limited in their functionality. They do not have the full, unlimited range of communications tools at their disposal. In addition, they cannot view full-size photos, which can make browsing somewhat constrained too. So, we recommend going for one of the several membership options. You can test the waters with a 3-day trial at $9.99, while a single month will cost a mere $29.99. A 3-month deal ends up costing $17.99 per month, while the 6-month package is worth $11.99 monthly. Whether you are a first-time online dater or an experienced user, MatureDating finds a great balance between simplicity and an attractive interface which will keep you engaged. For a start, online tutorials are on hand and the instant chat help service is available whichever page you find yourself using. As a result, help should you need it, is never far away. The tabs towards the top of the page place you just a click away from the search function, your inbox, chat rooms, a record of your activity and your account details. There are some great convenient tools as well. For example, you can create a favorites list (each of your favorites will be informed), a friends list and see who is online at a glance. Although there is no app, the Mature Dating site is fully optimized for mobile use. There are two broad types of search available at MatureDating.com. You can conduct a basic search, which includes broad search criteria such as age, location and whether a profile picture is included. This is a good option to cast your eye over the general options. 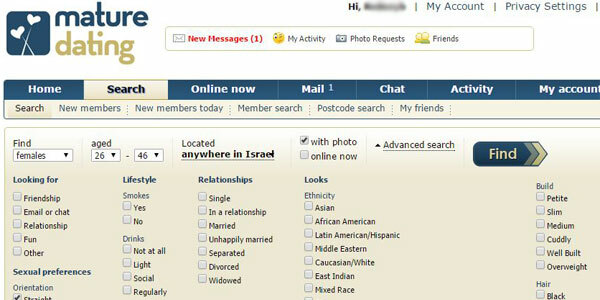 If you wish to be more specific, then the advanced search adds a whole range of options, including the type of relationship, ethnicity, a range of physical attributes and attitudes towards smoking and drinking. In addition to all of this, you can also search new members and who is online now, allowing you to cast your eye over the latest potential matches. This is a site which was previously limited to just the UK. However, a recent expansion has brought MatureDating.com to the US, Canada and Australia too. And this Mature Dating review can only predict that it will be equally popular in these new markets. If you prefer a popular general dating site with a good selection of senior users, then check out our review of Zoosk.com. However, if you are searching for a dating site dedicated to matching singles over 40s whatever their age or circumstances, then Mature Dating is excellent. Simple to use, top features and fully focused on real life dating, you are bound to meet someone new.